Hotshots is a screenshot tool with some editing features. It is particularly suitable for writing documentation (as used in the following chapters) but you can use it to highlight some details on a map image or what ever you want. Because HotShots is written with Qt, it runs on Windows and Linux (MacOSX isn’t tested yet). Save the screenshot in multiple formats (PNG, JPG, BMP, …). Export edited image in multiple formats (PNG, JPG, BMP …). Send image directly to printer. 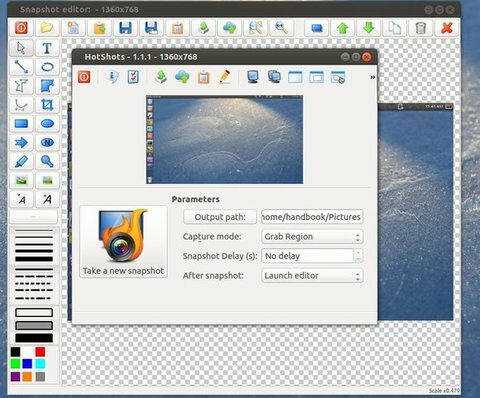 Hotshots is available in a launchpad ppa for Ubuntu 13.10 Saucy, Ubuntu 13.04 Raring, Ubuntu 12.10 Quantal, Ubuntu 12.04 Precise and Linux Mint 13 Maya, 15 Olivia, 14 Nadia , 16 Petra and other Ubuntu derivatives. The capture reigon option doesn’t work for me but the other capture options do. Also , in the editor, no undo buttons. Great tool but without undo buttons in editor I’m not able to do anything. Screenshot & Annotation Tool ‘HotShots’ 2.2.0 Released.